My wife’s parents are pushing 90, which is apparently the age when you no longer care about the lifetime of stuff you’ve accumulated. When they moved into assisted living they left behind their house and most things in it, and declared no interest in ever going back. My wife disposed of their unwanted stuff and put the house on the market. While helping her sort I came upon boxes filled with color slides, the vast majority of which are Kodachromes. They showed images of my mother-in-law as a teenager with her family, as a student at the University of Pittsburgh, and as a young wife with my father-in-law. 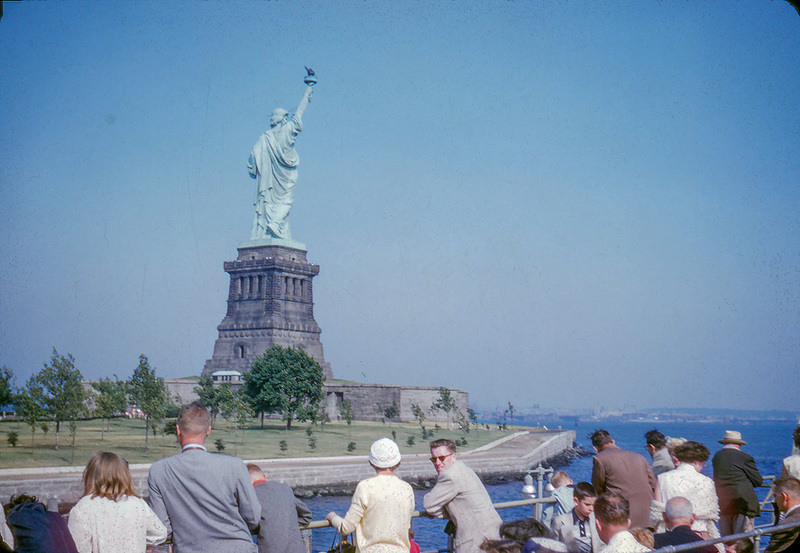 Given her age, and given notes on a very few slides, these images are from about 1946 through the early 1950s. These would be memories that my wife’s family would value seeing. So I brought them home and scanned all 743 of them, and shared them via Dropbox with the family. I haven’t asked the family’s permission to share with you photos that are obviously of family members. But I think it’s safe to share these photos of places the family visited. Because I think you’ll agree that they’re delightful. I have little idea where most of these images were made, or why. As an aside, I realize that some poor eventual grandchild of mine might be similarly puzzled over my photographs, should he or she come upon them. I should document them better. 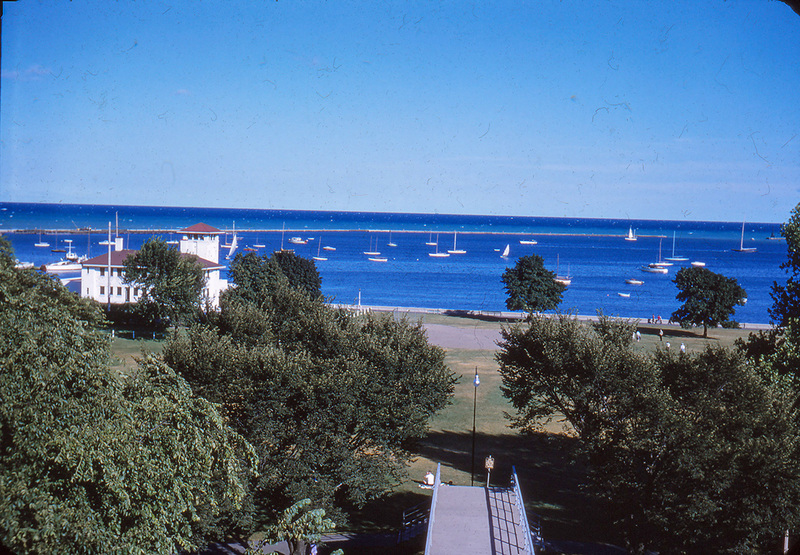 But for now just enjoy the great Kodachrome color. And for the camera geeks in this audience, you’ll enjoy knowing that some of these images are on 35mm film with its 36x24mm image, and others are on 828 film with its 40x28mm image. Both films are 35mm wide, but 828 was a traditional roll film with backing paper. I found a Kodak Pony 828 camera with these slides; I wonder if it was used to make any of these images. Enjoy the scenery. While the people who made these slides were clearly not accomplished photographers, they captured some lovely scenes. This family loved to go. 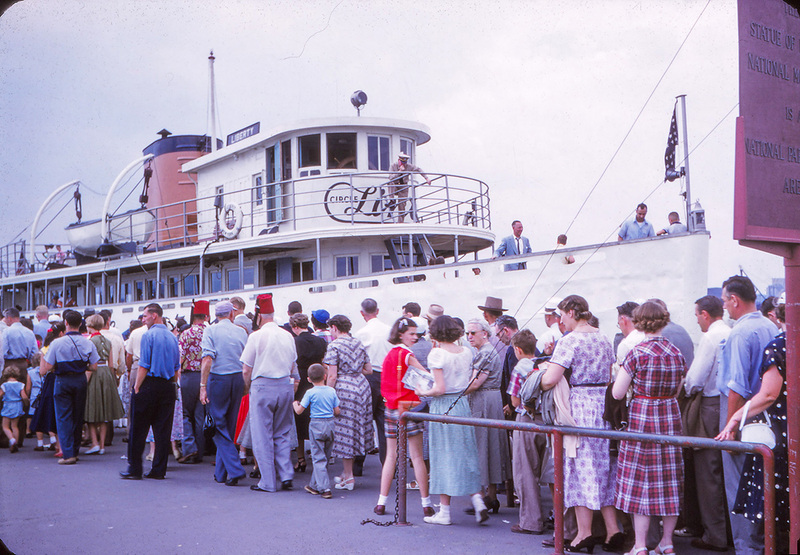 The slides record planes, trains, and ships, and the places they reached on them. Here the photographer was about to board a boat to go see the Statue of Liberty. I guess this runs in the family — Margaret and I and two of our kids did much the same thing a couple years ago; see those photos here. Our cruise merely passed by Lady Liberty; this cruise stopped on the island. The slides include many images of Canada. From my mother-in-law’s stories I gather that they either lived in Vermont or at least had property there, which made Canada an easy place to visit. I’d love to know what bridge this is. I did about a half hour of research trying to figure it out with no luck. My whole life Canada’s flag has been the maple leaf, but that certainly wasn’t the case in the late 1940s. As I try to piece together story from these slides, I believe the family took at least one extensive trip through eastern Canada. 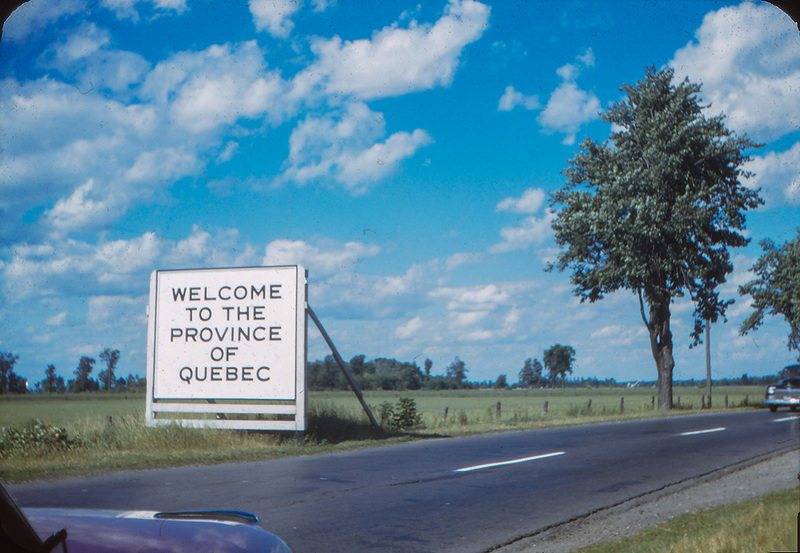 I believe this image to be somewhere along the Ontario-Quebec border. The family also traveled domestically. 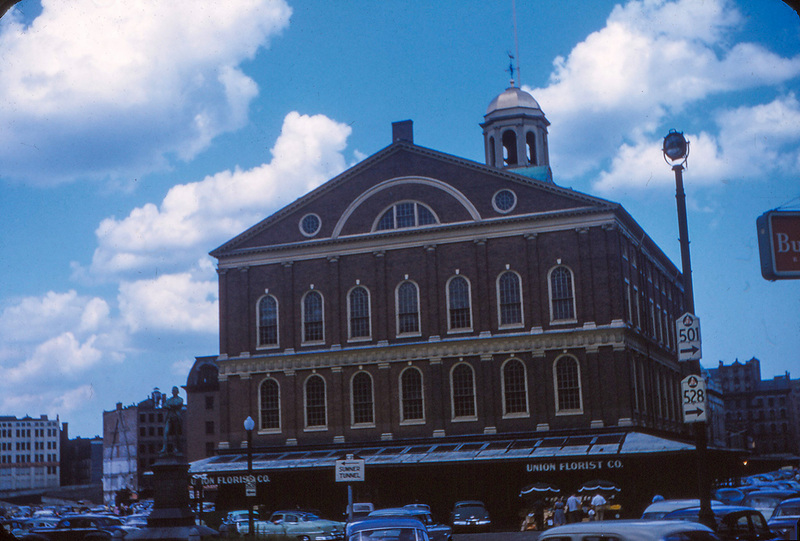 This is Boston’s Faneuil Hall. Check out especially the signs for Routes 501 and 528 in the image, with the Civil Defense logos on them. Apparently in the early 1950s Massachusetts had a set of numbered, marked routes for use in times of national crisis, when main routes might be needed for military use. What a time the early Cold War years must have been. 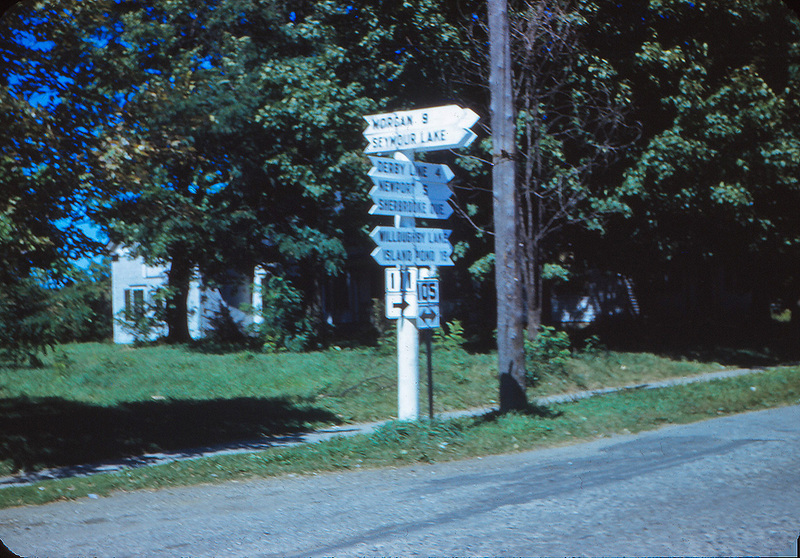 Speaking of route markers, here’s a photograph of the T junction of Vermont state highways 111 and 105. A little roadsleuthing helped me find that this is near Derby, in the northeast corner of Vermont. Click this link to see on Google Maps Street View what this looks like today. 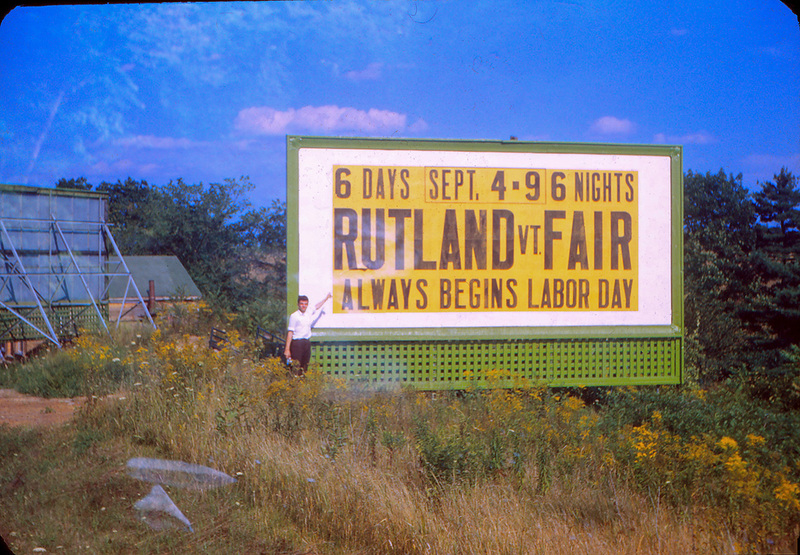 Downstate from Derby is the city of Rutland. 70 years ago, its fair always began on Labor Day. Maybe it still does. My mother-in-law may have been a majorette in the marching band while she studied at Pitt — there are several photos of her in such a uniform. 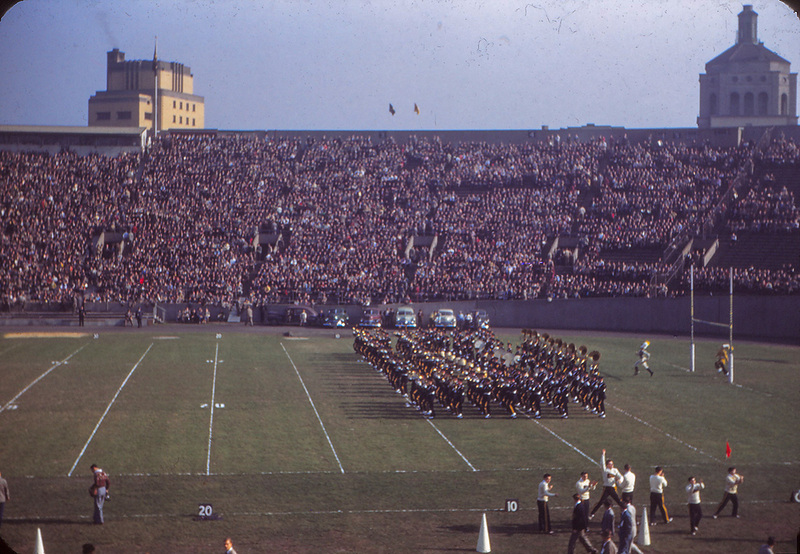 There are also several photos of the band on the ball field. This is the best of them. I’m betting this is Pittsburgh. I’d love to know exactly where, and whether the buildings are all still there. It’s too bad that these slides were stored in random order, and were processed before Kodak started stamping processing dates on the slide mounts. It made it challenging to group these photos into their stories. I made a stab at it for the family and hope some of them can refine the organization more. I’d better get busy documenting my photos. I just keep them in a folder system organized by date. If I wrote a Readme file in each folder I’d be doing future family a favor — if I’m so fortunate that some photo geek, maybe even yet unborn, stumbles upon them after I’m no longer interested. Although I am no photographer, I love gazing into old Kodachromes. These are lovely. They are also history! A view into how things once were. Cool story to go with these slides Jim, they have stood the test of time well and are great to see. I miss Kodachrome with a passion it was a wonderful film and so stable. I remember Kodachrome 828 well I sold quite a few Rolls of it in the late 60’s & early 70’s. 828 was discontinued in 1985 but I think the Kodachrome version had been dropped earlier. I never got to shoot 828 before it disappeared. I believe I had an 828 camera in my early collection. But I had so little money in those days! Exotic films like 828 and 620 cost far more per shot than 35mm or even 126, so I stuck with those mostly. I didn’t start shooting slide film until about 5 years ago, so I missed out on Kodachrome too. There is something just so special about the Kodachrome look. Occasionally in an antique store, there will be a box of old slides for sale and I am always amazed that, not matter how it was stored, the Kodachrome color holds up. Thanks for sharing these. You know what’s most special about that Kodachrome look? That it lasts. There were about 20 Anscochromes in the box and I had to do all sorts of Photoshoppery to rescue those images, so faded they had become. Very interesting. A heroic effort on your part JIm. I was sick for a few days — not so sick I had to be confined to bed, but sick enough that I couldn’t go to work. So I just sat at my computer and scanned. I also watched YouTube videos while I waited. It was a nice way to spend a few down days. Hmm, interesting bridge shot. It’s a 4 lane truss bridge, with another bridge in the background. 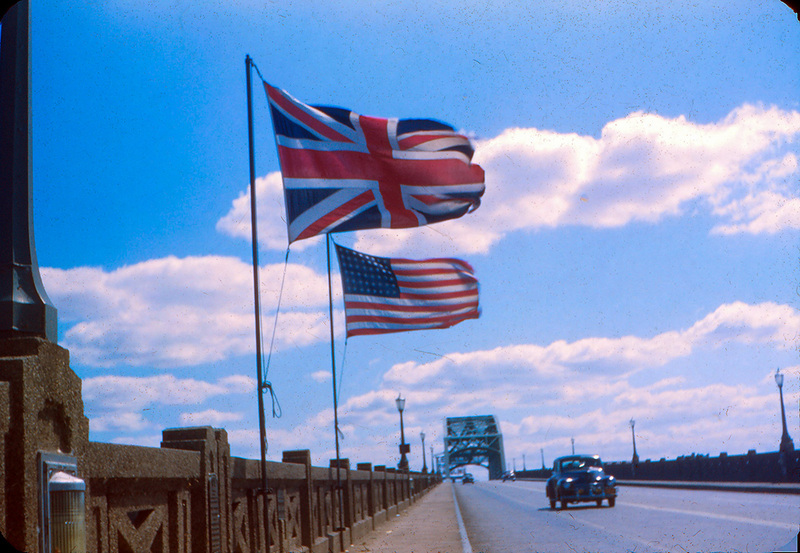 I agree it’s along the St. Lawrence somewhere, as they tend to island hop the bridges on the border crossings. It’s the Peace Bridge between Buffalo NY and Fort Erie Ontario. Doug, thank you so much for IDing that bridge! It’s great to know it’s still there. Looks like that concrete railing got replaced somewhere along the way, looking at modern pics of this bridge. Yeah, that threw me a bit. Goodness knows I’ve spend enough hours sitting on that thing that I should be able to ID it. The curve in the opening under the truss is the giveaway..
That last photo of the city street looks more like maybe Quebec. My first thought when I looked at it was “Paris”. Buildings like that are seen in the French quarter in New Orleans, and in the small towns along the Rideau Canal in eastern Ontario. All the autos are very early ’50’s or earlier. One interesting change is evident in the small harbor scene- all those boats are wooden. They would all be museum pieces today or valuable toys for a wealthy person. I scan a lot of slides and I am always amazed how well Kodachrome stands up to time compared to Ektachrome or the other pretenders. Agfachrome does pretty well too. Here’s hoping someone comes along someday who can pinpoint that street scene! At full resolution the details are too blurry to make out tiny details that would give clues, such as license plates. 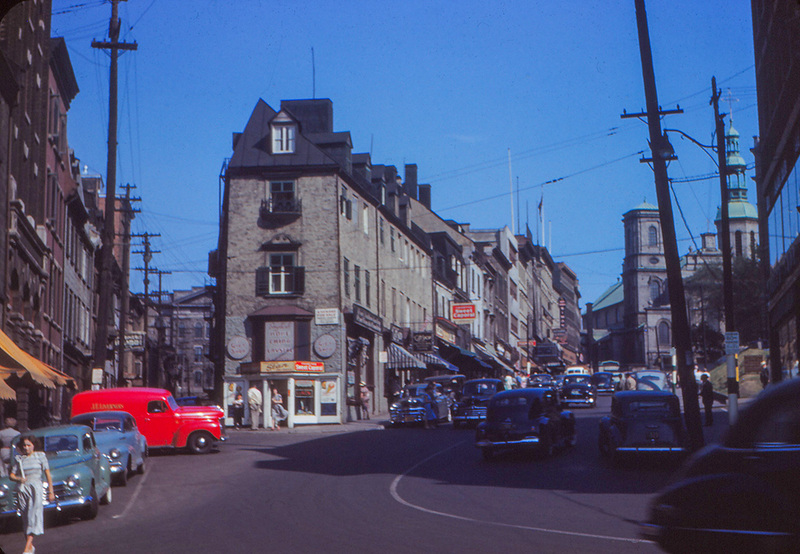 It’s Cote de la Fabrique and Rue Coillard in old Quebec City. We stayed just around the corner from there on our trip last year. I told you that you need to go there and photograph the city, now you have another reason to go! Holy wow, there it is! These are great! I have spent a lot of time cataloging and organizing my photos. I’ve told my children that they mean a lot to me, but that they can just get rid of them if they would like, to not feel guilty about that. I need to tell my sons the same thing. I know there are some with the genealogy bug who will care, but after a couple generations most will consider old photos to be curiosities. I just don’t want to add an extra burden to their grief I guess. Nice job of sorting out those family photos. You found some real gems. I shot a lot of slide film up into the 1990s. It is certainly a lot easier to sort through positive transparencies than to judge the contents and quality of negative images. These really are the best of the scenic photos. Whoever took all of these was no photographer! But to the family they are all deeply interesting, as so many of them show views of family still with us when they were quite young. 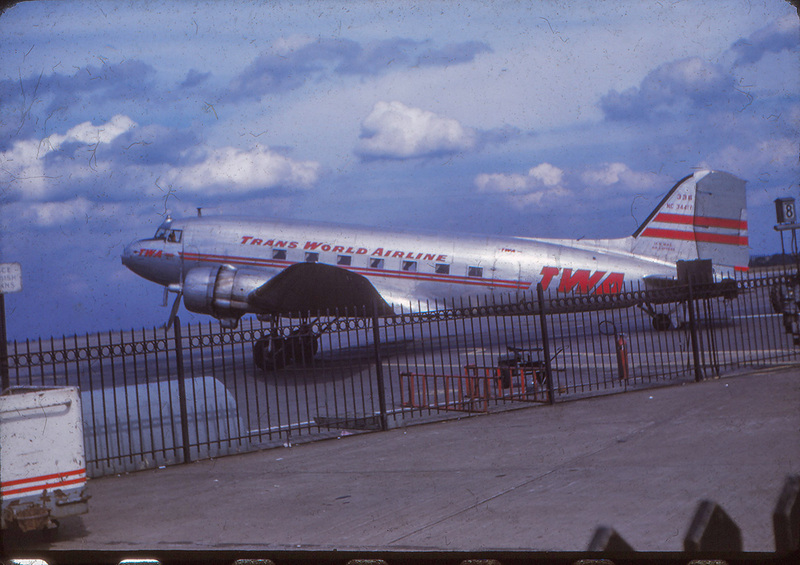 That photo of the TWA DC3 really is amazing. The plane and the clouds are very nice. The angle of the horizon and the plane make me dizzy just looking at it. Good thing I’m sitting down, if you hung that photo in a museum there’d be a pile of people on the ground beside it. Is it a poorly composed photo, or a surrealist masterpiece? The camera was definitely not level when that photo was taken! Wow, what a cool glimpse into history, very enjoyable slide! It’s always cool to take a look back! Wow, touching images. 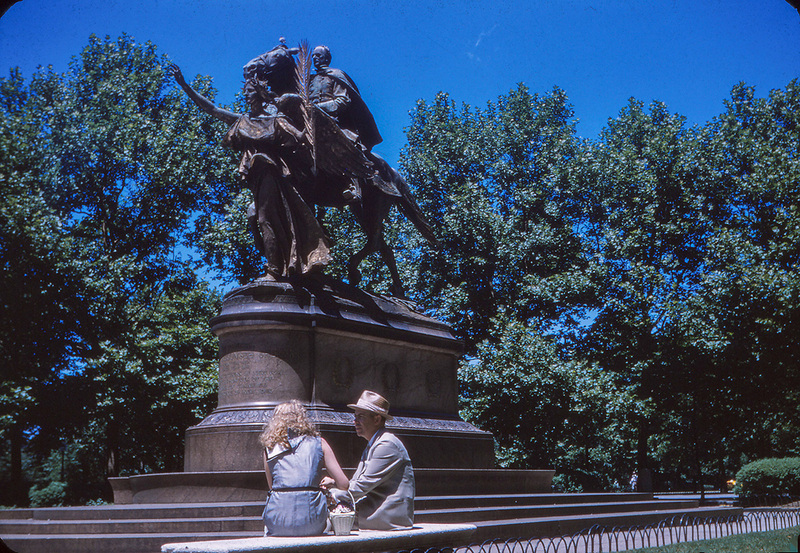 No doubt about it, that Kodachrome world was a simpler, kinder, more gentle world (at least if you were of European descent and your family had been here for a couple of generations). It’s the world I grew up in so I recognize those scenes…. The Vermont scene is confusing – I just can’t reconcile the modern image with the old picture unless the buildings (out of view to the left) that are there now are new – – – but their architecture suggests they are old. Maybe this is like so many roads in the Midwest, the alignment of 111 has been changed. Yes, I agree, the buildings at that intersection look too old not to have been there when the Kodachrome was made. You could be right about a realignment. After the death of our mom, one of my sisters took it upon herself to scan and date (as best she could) the hundreds of slides our dad took. Thanks to her, we’ve shared them and enjoyed them immensely. The pictures may not mean much to future generations, but they mean the world to us. It’s the first and second generations that enjoy the photos the most, I think. How wonderful that your sister scanned all of those photos! Great slides, and how nice to get some of the mystery locations solved. The one I’m wondering about is shot #4, the harbor scene before the DC3. I can’t decide if it actually looks familiar or if that building is just typical of shoreline architecture. 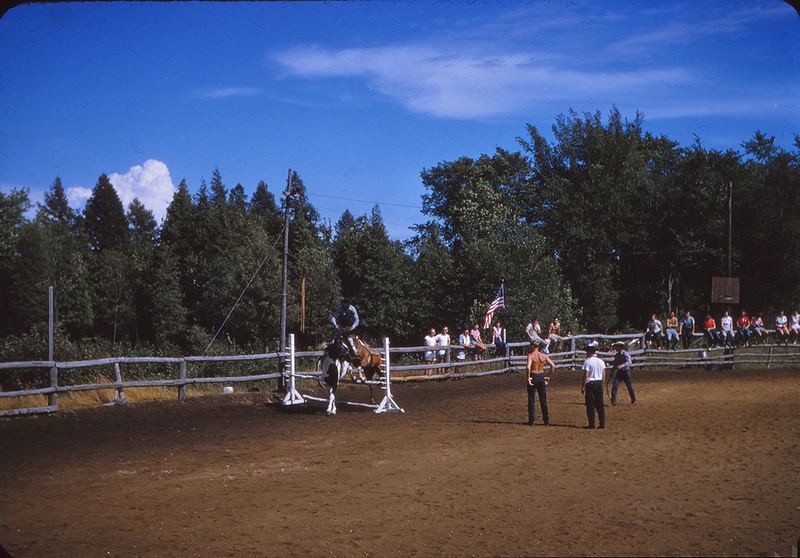 My grandfather shot a bunch of Kodachrome from the early ’50s through the late ’60s and I’ve scanned a handful recently. I actually used my DSLR with extension tubes based on one of your weekend links from a while back. If you figure out the harbor location, do let me know! I just used my CanoScan 9000 for these, and the default Canon scanning software. Worked well enough. Any suggestions or recommendations on what to use to scan slides? 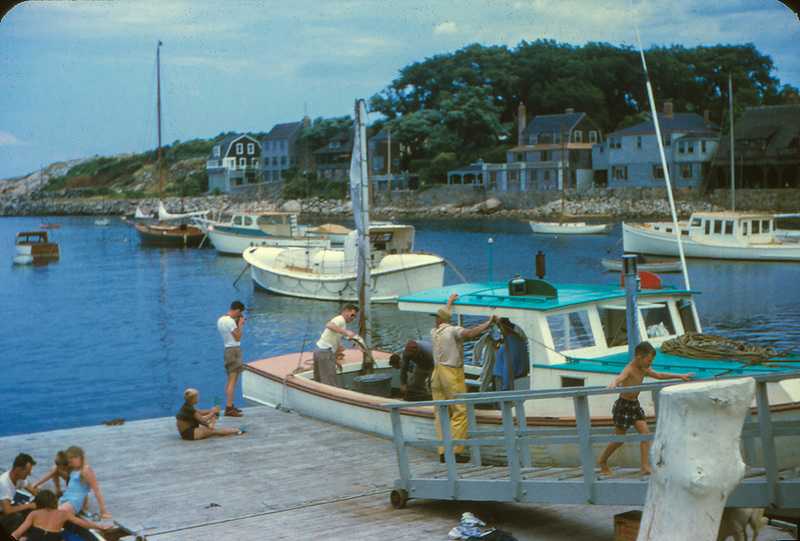 I have a box of Kodachrome 64 to digitize. 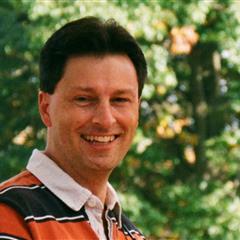 I just used a flatbed scanner, my Canon CanoScan 9000 Mk II, and the default scanning software. I could probably have gotten somewhat better results with Silverfast, which I haven’t bought for this scanner yet. Great that you saved these! I used to stop and chat with an old gal in Zionsville, who had spent most of her life in another part of the country. Her son moved her up here in retirement. Long story short, one day she “disappeared” and her house was sold. I eventually found out she was moved someplace into assisted living, BUT, her house was torn down for a rebuild, and the guys tearing it down told me they found a huge cache of her personal photos that were left behind, and they just junked them in a bin the week before! A crime against society! What a terrible shame. The family should have had at least a chance to sort through them. You know, I think the reason it happened was that the kids didn’t care…philistines!